Higher denomination definitive Swiss stamps went through a new evolution, beginning in 1938. 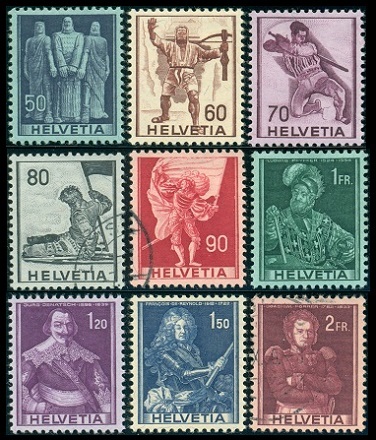 The higher denomination definitive stamps of the Seated Helvetia with Sword Types had been around since the beginning of the century, and it was time to replace them. 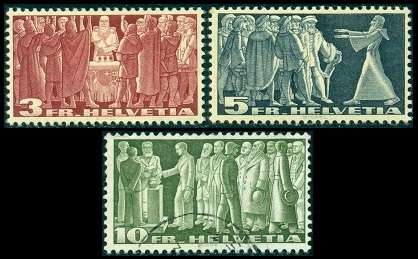 New medium sized and larger, wide-format, higher-denomination stamps first appeared in 1938, and the new designs, with a more modernistic look and feel to them, featured Swiss Symbolic and Historical subjects. These new definitive stamps were well received and they would remain in use as the definitive postage stamps of Switzerland for the next twenty years! The three Symbolic Type high denomination definitive Swiss stamps shown above were issued on September 17, 1938. These stamps are engraved on greenish granite paper. 03 F. (1938 - Greenish Paper - ZU #216v, Mi. #328v, Sc. #244) - First Federal Pact in 1291. 05 F. (1938 - Greenish Paper - ZU #217v, Mi. #329v, Sc. #245) - Diet of Stans in 1481. 10 F. (1938 - Greenish Paper - ZU #218v, Mi. #330v, Sc. #246) - Swiss citizens voting. The three Symbolic Type high denomination definitive stamps shown above were issued on May 11, 1942. These stamps are engraved on yellowish granite paper. These three definitive stamps were re-issued on July 27, 1954. They are engraved on yellowish surface-colored granite paper. That is, the back side of the stamp is white, instead of yellowish. The surface-colored paper issues are the less expensive of the two paper varieties. 03 F. (1942 - Yellowish Paper - ZU #216w, Mi. #328w, Sc. #284a). 05 F. (1942 - Yellowish Paper - ZU #217w, Mi. #329w, Sc. #285a). 10 F. (1942 - Yellowish Paper - ZU #218w, Mi. #330w, Sc. #286a). 03 F. (1954 - Surface Colored - ZU #216x, Mi. #328x, Sc. #284). 05 F. (1954 - Surface Colored - ZU #217x, Mi. #329x, Sc. #285). 10 F. (1954 - Surface Colored - ZU #218x, Mi. #330x, Sc. #286). 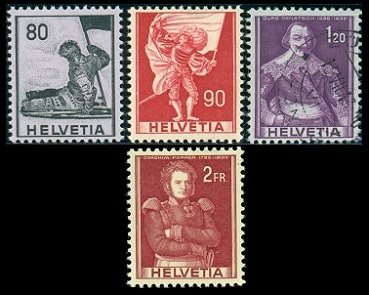 The nine Historical Subject Type higher denomination definitive Swiss stamps shown above were issued on January 15, 1941. These stamps are engraved on tinted granite paper. 50 C. (1941 - Greenish Paper - ZU #243, Mi. #377, Sc. #270) - Oath of the Rutli (c. 1307). 60 C. (1941 - Salmon Paper - ZU #244, Mi. #378, Sc. #271) - William Tell (14th Century). 70 C. (1941 - Lilac Paper - ZU #245, Mi. #379, Sc. #272) - Fighting soldier, Battle of Marignano (1515). 80 C. (1941 - Grayish Paper - ZU #246, Mi. #380, Sc. #273) - Dying soldier, Battle of Marignano (1515). 90 C. (1941 - Pale Rose Paper - ZU #247, Mi. #381, Sc. #274) - Standard bearer. 1.00 F. (1941 - Greenish Paper - ZU #248, Mi. #382, Sc. #275) - Colonel Ludwig Pfyffer (1524-1594). 1.20 F. (1941 - Grayish Paper - ZU #249, Mi. #383, Sc. #276) - Colonel Jörg Jenatsch (1596-1639). 1.50 F. (1941 - Salmon Paper - ZU #250, Mi. #384, Sc. #277) - Lieutenant General François de Reynold (1642-1722). 2.00 F. (1941 - Pale Rose Paper - ZU #251, Mi. #385, Sc. #278) - Colonel Joachim Forrer (1782-1833). 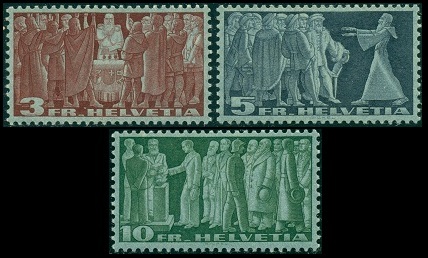 The four Historical Subject Type higher denomination definitive Swiss stamps shown above were re-issued in 1958 and 1959. These re-issued stamps are printed on tinted granite papers that differ from the papers used for the 1941 issues. 80 C. (1958 - Pale Lilac Paper - ZU #339, Mi. #683, Sc. #273a) - Dying soldier, Battle of Marignano (1515). 90 C. (1959 - Salmon Paper - ZU #340, Mi. #684, Sc. #274a) - Standard bearer. 1.20 F. (1958 - Pale Lilac Paper - ZU #341, Mi. #685, Sc. #276a) - Colonel Jörg Jenatsch (1596-1639). 2.00 F. (1959 - Salmon Paper - ZU #342, Mi. #686, Sc. #278a) - Colonel Joachim Forrer (1782-1833).